The combined pill is the most common and is usually the one people refer to when they say “I’m on the pill”. The combination pill gets its name because it contains a combination of the two female hormones oestrogen and progesterone. There are many different brands of this pill available, some of the most popular brands include microgynon, marvelon and Yasmin. The pill works by keeping the sperm from the egg or stops the ovary releasing an egg so that a woman will not get pregnant. The pill thickens the mucus in the neck of the womb to make it harder for the sperm to move through the cervix, it also thins the lining of the womb so there is less chance of a fertilised egg developing. How do I take this pill? The pill is usually taken once a day for 21 days then you have a break for 7 days. During this 7 days break you will have a period type bleed. You need to take the pill at the same time every day to avoid pregnancy occurring. If you think you might forget to start taking them again, then there are every day pills available where there is no break. A pack will contain 21 active pills and 7 inactive pills, the 2 pills will look different. If you don’t want to have a bleed then you can take the next pack straight away without a break. When starting the pill for the first time you can usually begin at any time during your cycle, though additional contraception may be required on the first few days especially if you start the pill after the 5th day of your cycle. Is this the right contraception for me? The combined pill isn’t suitable for everyone, for example women with uncontrolled high blood pressure, are overweight, suffer certain types of migraine, previous heart disease or stroke or have a family history of blood clots may not be able to use this pill. Your GP or nurse will be able to advise if it is suitable for you. If there is no medical reason to stop you, then most women can take the pill until they reach the menopause. If you are breastfeeding then you are advised not to take the pill until 6 weeks after the birth. Always remember that the pill does not protect you from sexually transmitted diseases so you may need to use condoms as well. What are the advantages of this pill? Reduce your risk of ovarian, colon and cancer of the womb. Protection from pelvic inflammatory disease. What are the disadvantages of this pill? The combined pill has been linked to an increase risk of blood clots, this is due to the oestrogen in the pill, the risk is very small and your health advisor will be able to advise if the pill is suitable for you. 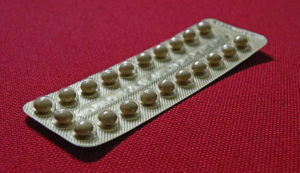 There is also ongoing research on the link between hormone contraceptives and breast cancer . Research indicates a slightly higher chance of developing breast cancer compared to women who do not take the pill. The other disadvantage is you have to remember to take it daily, if you miss a pill or are ill with sickness or diarrhoea then you could fall pregnant. Some medicines may make the pill less effective, if you take any medication check with your doctor before taking the pill. There are also some antibiotics that can reduce the effectiveness of the pill so you may need additional contraception whilst taking a course of antibiotics. What do I do if I miss a pill or am ill? If you are ill or miss a pill then you can get pregnant. The chances of pregnancy will depend on how many and when they are missed. If you have missed 1 pill then take the missed pill straight away even if this means you are taking 2 the same day. Then carry on taking the pack as normal. If you have missed more than one take the last missed pill straight away, again this might mean you are taking 2 in one day. Do not take more than 2 pills in one day, you can just throw the missed pills. You should use additional contraception for the next 7 days. If you are sick or experience diarrhoea within 2 hours of taking the pill then you should take another one immediately then at your usual time the next day as the pill may not have absorbed into your bloodstream. If you continue to be ill then you should use an additional form of contraception such as a condom until you have taken the pill for 7 days without illness.